I was excited to hear that the May monthly kit from Personal Scrapper would include the "Delight" paperline by Fancy Pants. I fell in love with that line when I saw it previewed online for CHA at the beginning of the year. When I saw the color scheme, I knew it would fit with Easter photos. I pulled out Kevin's pics from this Easter and went to work. I'm on a collage kick right now and it's really a time saver (as far as cropping goes) and a money saving option, too. I was able to scrap Kevin's Easter from coloring eggs, seeing what the Easter Bunny brought, attending church, and hunting for eggs at Grandma's all onto 4-12x12 pages. Then I went back in time a bit and pulled photos from '06. Here's one for Blake's album. I lifted a LO in CK's new Easier than Ever Scrapbooking 2 idea book. The original LO was by Kim Arnold. 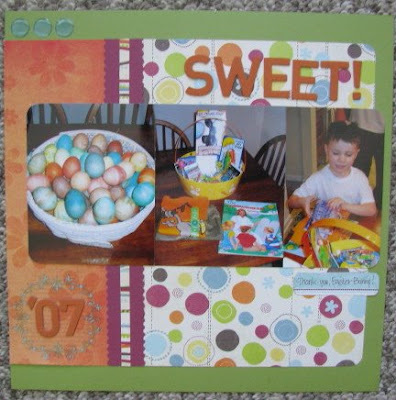 The paper placement for "Sweet" was inspired by a LO in CK's new Easier Than Ever Scrapbooking 2 idea book. The LO was by Nicole Samuels. These pics are from Easter '07. I posted when Kevin got his glasses. Now I have the photos documented for his album, too. 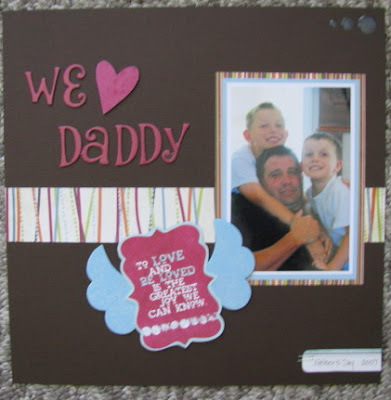 I completed this challenge during the National Scrapbook Day crop at Personal Scrapper. Fellow member Lynette challenged us to make a 2-page LO about ourselves. I made a 2-page 8.5x11" LO using pics of me in the only wedding party of I was ever part of (except as the bride!). I can't believe these pics are almost 25 years old! They were taken about a month before I started 5th grade. Now, my own son will start 5th grade this fall. Is that crazy or what?? I loved the quote card that came with the kit and wanted to use it with a parent/child photo. This photo of Tom with the boys on Father's Day '07 worked with it. 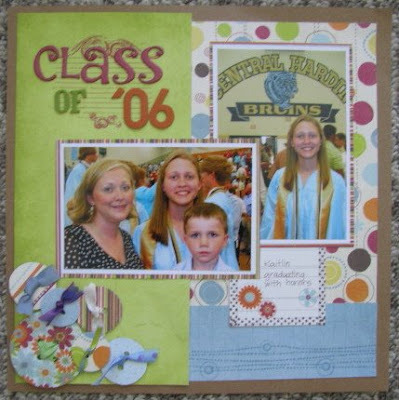 To use of the rest of my scraps, I completed this page for Kevin's album about Kaitlin's high school graduation. I just added a couple AC Thicker fonts and scraps of ribbon I had leftover from old PS kits. Now I guess I'll patiently wait for the June kit to arrive!